What Do You Call Baby Owls? (noun) An owlet is a young baby owl, typically a recently hatched bird that has not yet developed its full mature plumage and is still dependent on its parents for feeding, care, and security. Owlets do not usually leave the nest for long and cannot completely care for themselves, but as they get older they will explore near the nesting area and may even be found on the ground. Like all baby birds, owlets are distinctly different from mature, adult birds. These young birds have a great deal of soft, fluffy down and generally lack clear markings, but their facial discs are one of the first plumage features to develop. The shape, size, and color of the disc can be highly useful in proper owlet identification. Eye and bill color can also be helpful in identifying baby owls, though some young birds have slightly different coloration than mature birds. For owl species that have ear tufts, owlets may also show short fluffy nubs on their heads, though they lack the full shape, coloration, and dexterity that mature owls will have with their ear tufts. The wings may also develop early in owlets, and the young birds may show barring or other markings on their first flight feathers while their bodies are still covered with indistinct down. Baby owls are typically unable to fly but may have left the nest to strengthen their wings and legs by exploring nearby branches or rocks, climbing or jumping about in a process called "branching." They may perch in unusual areas or even rest directly on the ground with little regard for being in full view of predators. They may be curious about nearby objects, even other animals, and will use their large, bold eyes to carefully observe their new world, often twisting their heads around to see things from different angles. Young owls often stay close to their siblings, and it is not unusual to see several owlets together. Different owls have different juvenile periods and mature out of their owlet phase at different rates. Smaller baby owls often mature more quickly and may be indistinguishable from adult birds within just a few weeks after hatching. Larger owl species, however, may take several months to grow out of the owlet stage of development and gain complete independence. 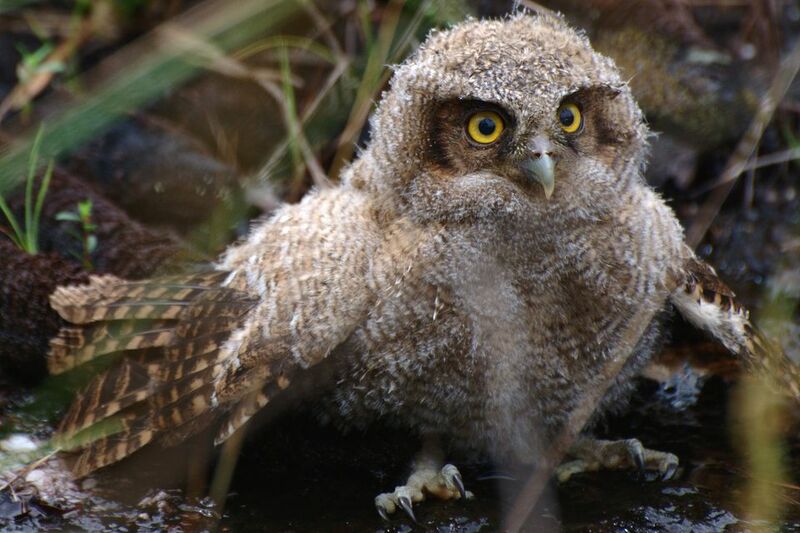 Overall health, food availability, climate, and stress can all affect how quickly a baby owl matures. Mature parent owls can be highly protective of their offspring and have been known to viciously attack anything they perceive as a threat, including other birds, large mammals, and even humans. Birders should always be cautious when watching owlets and keep their distance to avoid stressing the young birds or antagonizing their parents. If a young owl appears to be in distress or shows signs of injury, it is best to contact a licensed wildlife rehabilitator, bird rescue organization, or other wildlife authorities for assistance to be sure the bird is safe and healthy. Birders should not try to capture or rescue a baby owl on their own, since improper handling could cause greater problems or additional harm. Furthermore, young owls may be inexperienced and immature, but their talons and bills are still sharp and powerful, and when stressed or frightened even young owls can cause severe injuries. Children and pets should also be kept away from baby owls to minimize stress and the risk of injuries to owls or observers. The term owlet is also part of the common name of two dozen small owl species and many of their associated subspsecies, such as the spotted owlet, chestnut owlet, Javan owlet, forest owlet, and long-whiskered owlet. When the term is part of the species name, however, it is applied to both mature and young birds, whereas all young owls of any species can be referred to with the generic term owlet. The owlet-nightjar family also uses the term, though they are Aegothelidae birds and not considered true owls of either the Strigidae (typical owl) or Tytonidae (barn owl) families. Owlet-nightjars are more closely related to nightjars, frogmouths, and nighthawks rather than owls, and the use of the term owlet for these species is descriptive only. These birds have heavily camouflaged plumage similar to most owls, large eyes, and many show indistinct or incomplete facial discs, but they are not owls and their young offspring are not called owlets.